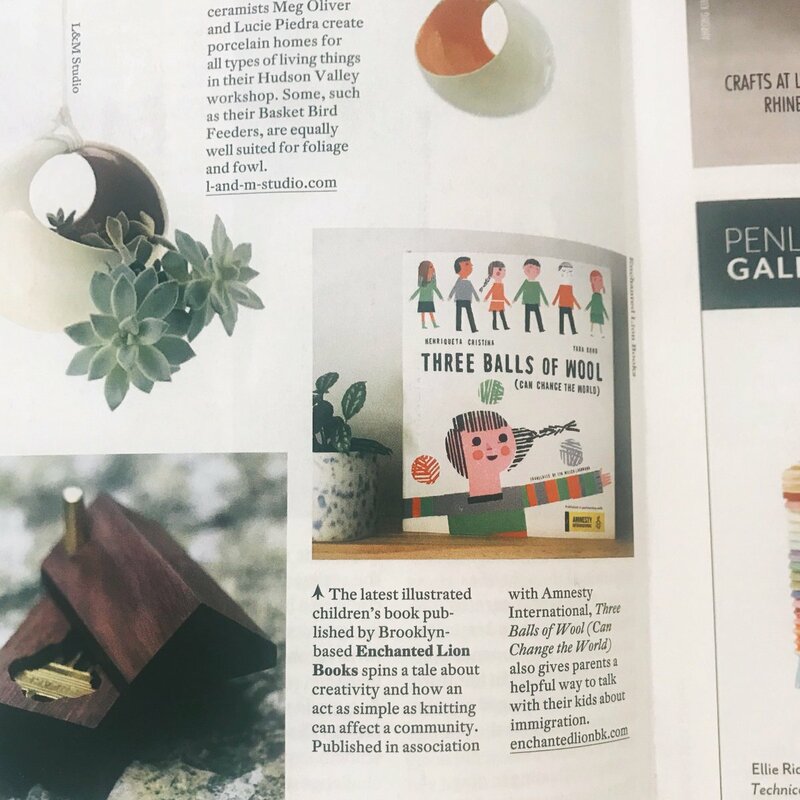 A review of Three Balls of Wool (Can Change the World) recently appeared in American Craft magazine, the first review I’ve received in a publication not normally devoted to books. I’m pleased because this expands the audience for the book, and as the review says, it “also gives parents a helpful way to talk with their kids about immigration.” Not related to the review, but in October, I spent a lovely afternoon at the Textile Arts Center in Brooklyn, as part of the Gowanus Open Studios festival. I read Three Balls of Wool to an appreciative group of young children and their parents and then alongside them took part in a finger-knitting activity. 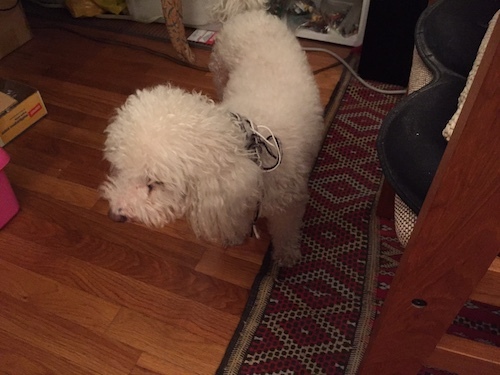 I knitted a scarf for Charlie, my Bichon Frise, which will be an appreciated addition to his wardrobe now that the weather has turned colder. Reading 3 Balls of Wool at the Textile Arts Center in Brooklyn. Photo by Alice Ashton. 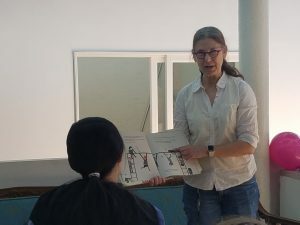 After the reading, one of the Textile Arts Center staffers interviewed me for their blog, but one of the problems with interviewing people is sometimes what they say doesn’t quite fit in with the focus of the blog. Recent years have seen a lot of interest in MakerSpaces in libraries, community centers, and elsewhere, where children and teenagers can come together to make all kinds of fun, useful, and creative things. When Rogue came out and I started creating scenes with my Lego bricks and minifigures, I presented at a New York Public Library branch and at a summer camp nearby, where the children photographed their creations and we posted them on Instagram. I also wrote a piece for Teen Librarian Toolbox about Lego building in MakerSpaces. MakerSpaces are great for building community and developing children’s skills and interests in a wide variety of areas, and at a time in which technology and political divisions have come to isolate us from our neighbors, these spaces are more important than ever. Turning the page at the Textile Arts Center. Photo by Alice Ashton. I remember you shared with me a line you added, for the purpose of closing somewhat of a cultural gap between Portugal and the United States, that the child learned from her mom how to knit the sweater (rather than her mom simply doing it for her), due to United States “DIY” mentality. If you are alright with me putting it into a blog post, would you mind telling me again in writing what this additional line did? The short paragraph that I added was not to show the girl learning to knit from her mother, but taking action to bring about wider social change by calling attention to her mother’s efforts. In a sense, the protagonist became her mother’s publicist or promoter, leading the other people of Prague to be inspired by her, learn from her, and make their own original designs. “What’s that sweater?” one girl asked. “My mother made it.” My voice grew stronger. “Come see,” I said, waving toward my mom. After that, on the next page, the square fills with all the other parents making sweaters while the children play. As a historical novel set in Portugal and Communist Czechoslovakia, the book reflects the culture of the places and era. 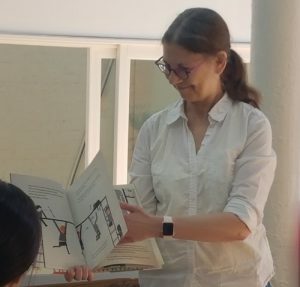 One thing I’ve found in picture books from Portugal is that the child protagonist generally doesn’t solve the problem, reflecting the stronger hierarchy in which adults have more agency and authority. And why are the children not portrayed as knitting in the scenes in Czechoslovakia? While you don’t see strong differences in gender roles—fathers are as likely to knit as mothers—this socialist country had very strong prohibitions against child labor, as exemplified by the fact that “all children go to school.” This contrasts with fascist Portugal, where children ordinarily dropped out young (or never attended school at all) in order to work in fields, market stalls, and factories. Charlie with his new scarf. One of the challenges of translation is bridging cultural expectations. The idea that “the child character solves the problem” is a particularly U.S. phenomenon that doesn’t carry over to more traditional, hierarchical societies. There’s a limit to how much that can be changed without defeating the purpose of the translation, which is to offer a window into different values and ways of life. And while MakerSpaces are valuable community resources in the U.S. today, other cultures, where children were previously exploited and only recently gained access to education and social welfare benefits, may see them as backsliding into child labor. While it may feel disconcerting to experience cultural differences in a translated work, it’s important to understand that the way we live is specific to our place and time. 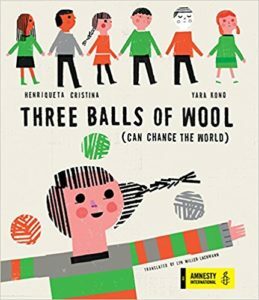 And when things begin to change quickly, we can look to other people and places to see how they, like the daughter and mother in Three Balls of Wool, adapted to their new circumstances and improved the lives of those around them as well.